Our range of high-quality pneumatic cylinders extends to ISO air cylinders, which conform to both ISO 15552 and ISO 6432 standards. 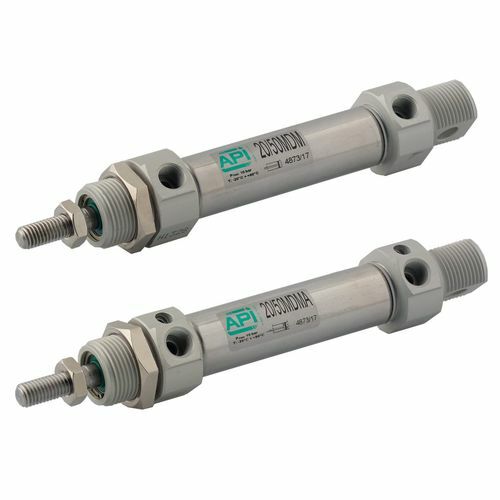 API ISO pneumatic cylinders are manufactured with attention to detail to create an effective, streamlined, modern design. The clean lines of our cylinder designs facilitate easy and effective SIP and CIP wash-downs for hygienic applications. All of our ISO air cylinders can be supplied to meet ATEX standards if this is required for your application. They feature pneumatic and mechanical cushioning to prolong service life and are lubricated for life, for use with non-lubricated systems. 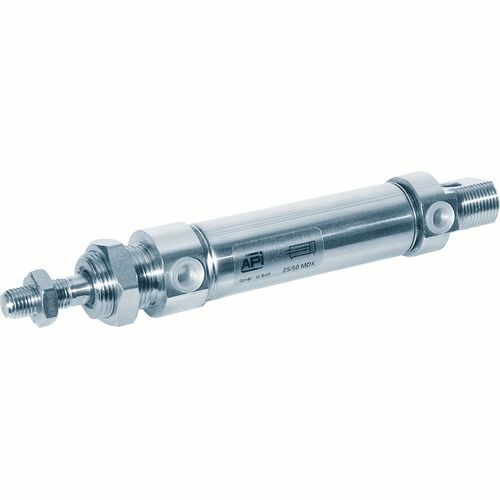 At API Pneumatic UK, we have double acting ISO 15552 pneumatic cylinders available in bores from 32mm to 125mm, with the option of two different barrel shapes. Firstly, we have the AMA type barrel, which is designed with grooves to allow the use of a flush-mounted magnetic switch. There are also two different shapes available for use with the AMA tube. The other barrel shape available is the AMT, which is designed with tie-rods. 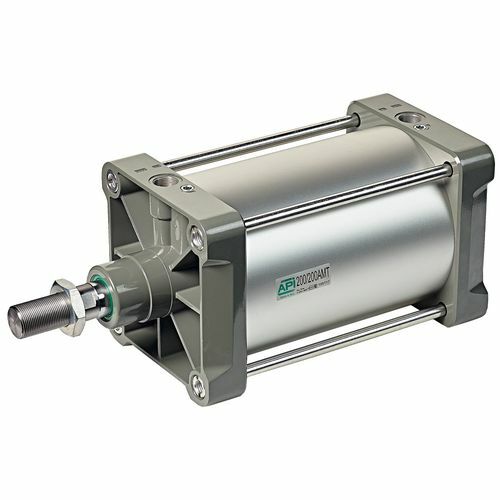 Our range of ISO 15552 pneumatic cylinders extends further to include bores from 160mm to 320mm. 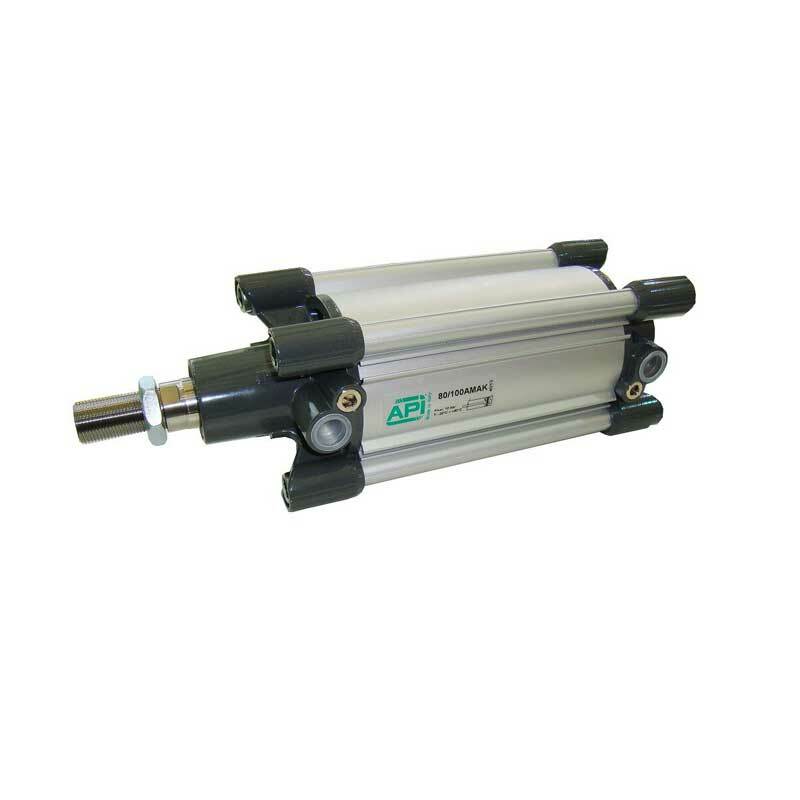 These specific ISO pneumatic cylinders are manufactured with external tie-rods and a round anodised aluminium tube. All of our ISO 15552 pneumatic cylinders are available with standard seals that perform exceptionally within the temperature range of -20°C to 80°C. However, other options are available. API can design your ISO cylinder with low-temperature seals to extend the temperature range to between -40°C and 80°C. Or our FKM seals can allow your ISO cylinder to withstand more extreme temperatures within the range of -20°C and 150°C. All of our ISO 15552 cylinders are for use with compressed filtered air and can be manufactured with a stroke length between 10mm and 2500mm. 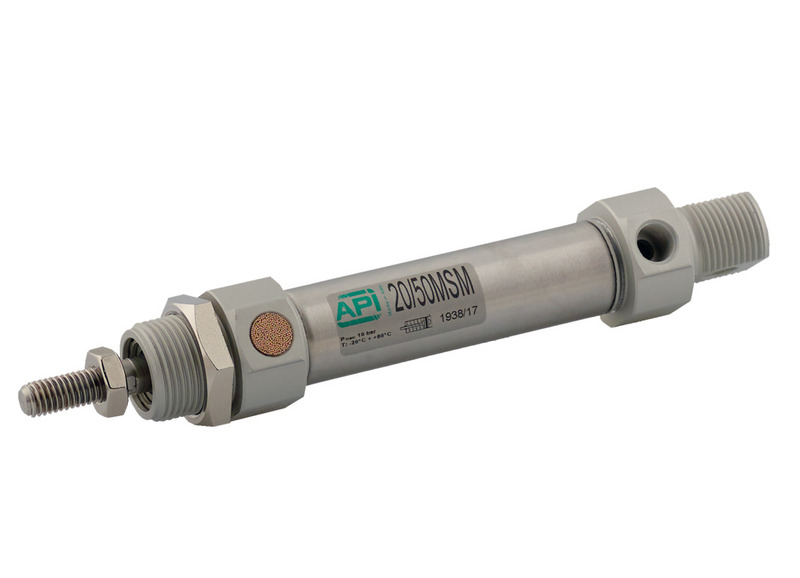 API Pneumatic UK also has a range of ISO 6432 pneumatic cylinders for use with compressed filtered air, as both single and double-acting versions. Our single-acting ISO 6432 pneumatic cylinders can be manufactured as both magnetic or non-magnetic, in 8mm to 25mm bore, to suit your application. 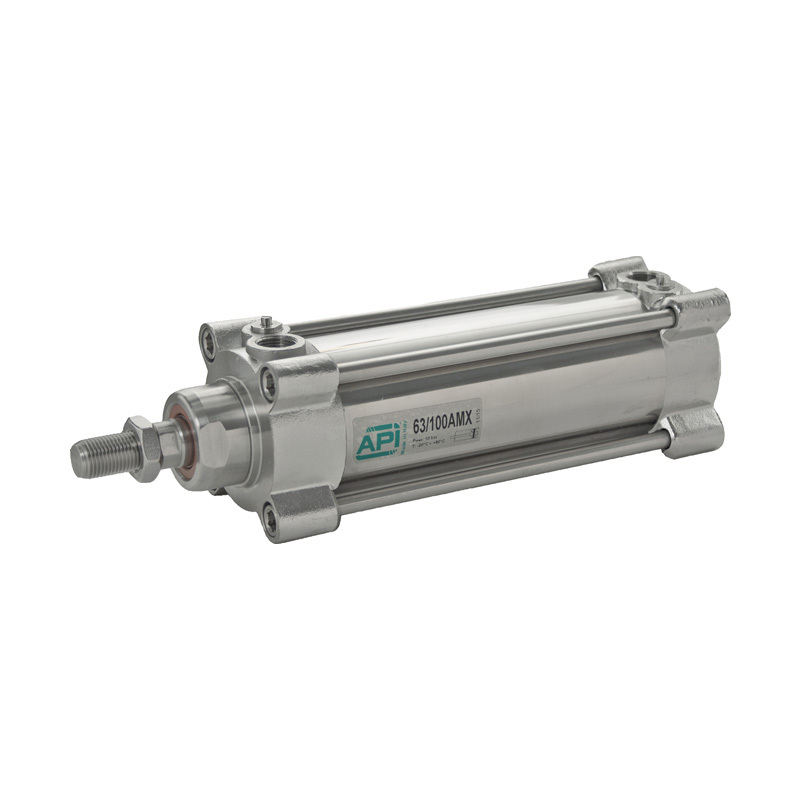 API double-acting ISO 6432 pneumatic cylinders are again available in 8mm to 25mm bore and as non-magnetic and magnetic versions. However, the double acting ISO 6432 cylinder can also be manufactured with the option of magnetic with cushioning, from bore 16 to 25mm. The standard temperature range of ISO 6432 cylinders is -30°C to 80°C. However, FKM seals can extend the temperature range further to -20°C and 150°C. API Pneumatic UK also specialises in same day builds of our ISO 15552 cylinders. Get your ISO 15552 pneumatic cylinder in 90 minutes, to prevent unnecessary downtime. This service is for ISO 15552 cylinders of any non-standard stroke lengths up to 1.5 metres and from 32mm bore up to 125mm bore. All of our ISO pneumatic cylinders, with every bore and stroke length, are available to choose from below. For more information on our entire ISO air cylinder range, talk to the technical team at API today. Call us on 01782 206 995 or email sales@apiuk.co.uk.